Stanley and Katrina von Cat the Master of Wisdom and Knowledge are celebrating the release of their second book, The Observations of the Obstreperous Animals, by hosting their very own "Book Blasty Tour". Thank you for taking the time to visit this special stop along their tour and be sure to enter the giveaway! Summary (Amazon): Cat and dog. It is a love/hate relationship. Stanley and Katrina are back to share more humorous glimpses into their exciting lives in their second book via short stories. Yes, the pets are at it again but this time compete in a slam poetry contest, visit a pet psychic, and much more.This cat and dog writing team makes you stop and wonder what happens at your house when you're not there. I really enjoyed the fun witty bickering way in their 1st book The Perpetual Papers of the Pack of Pets, you can read my review here. It is an honour to be able to read Stanley & Katrina's 2nd book The Observations of the Obstreperous Animals prior to the book’s release date and to do a review about the book too. Taken off from where we left off in the 1st book where Stanley & Katrina managed to destroyed a pet show, their owners are already planing for them; the Agility Course. We can see from a cat & a dog's perspective about the course and cats really do not like nor need to go for agility course. Ok, firstly I didn't know that there is an agility course for cats, do they even listen and follow the instructions to run through the obstacles? Anyway, in this story the pets set out for some new adventures when their owners moved to a new neighborhood. With the new things around them you can see clearly the different ways a cat and a dog deals with the same situation. New routines does not sits well with Katrina and she has called for a protest with a full 10mins of speech in front of the owner, which of course did not end well since the owners probably thought she was having a weird day and ignore her after that. And yes, dogs DO get away with things they do much easily than cats. Don't get what I mean? Well, you just have to read the book to find out. I liked that the Narrator even take part in the story this time, makes her looks more real in character especially with her mindless ranting. In this 2nd book, we see more of the pets revealing their true nature; cat's fascination with the toilet paper, dog's obsession with chasing the squirrel, guinea pig's dream of hmmm... eating non stop maybe? *chuckles* Kids will love to read about them and perhaps will hug their pet dog & cat harder the next time, look them in their eyes and say "I KNOW what you are thinking!" This book would be suitable for 8 years old and as it recommends, a great read a loud book to younger kids. Love the printables and especially the Cootie Catchers which I am sure I am going to have great fun playing it with my boy. 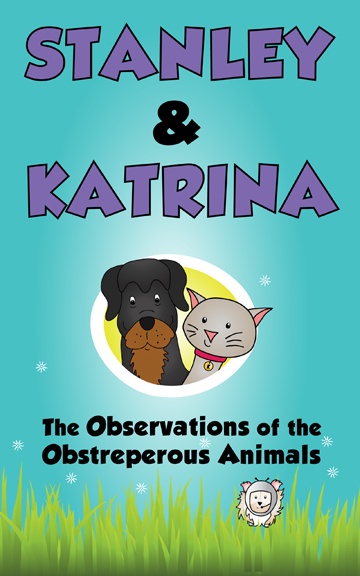 Stanley and Katrina are the pet authors of The Observations of the Obstreperous Animals. Stanley is a three-year-old black Labrador/Rottweiler mix who does his best to ignore Katrina. Stanley enjoys snow, attention and turkey. Katrina von Cat the Master of Wisdom and Knowledge is an eight-year-old grey tabby cat who loves her toy mouse.She enjoys treats, naps and bossing the dog around. Neighbor Girl (Felicia) is the human who knows us (Stanley& Katrina) the best and helps us with everything. She loves writing, reading, acting, singing, reading gymnastics, doodling, reading, ice skating, painting, reading, doing computer stuff, oh... did we mention reading? She is the co-creator and co-host of "The Write Chat." 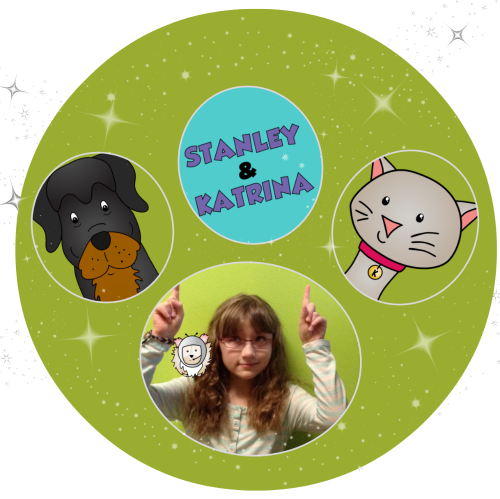 You may visit the entire gang online at www.StanleyAndKatrina.com. Felicia's new release (The Observations of the Obstreperous Animals) received a 5 Star Rating from Readers' Favorite. Here is the post where we talk about it. The biggest news is that as of Wednesday, Felicia is now an Award-Winning Author. 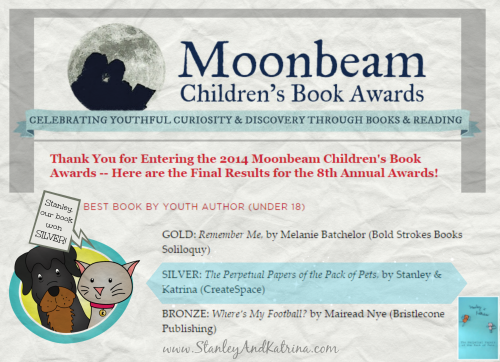 She won the Silver Award from the 2014 Moonbeam Children's Book Awards in the "Best Book by Youth Author (Under 18) for her first book (she was 9 when she wrote it), The Perpetual Papers of the Pack of Pets. She was THRILLED that it had Stanley & Katrina and not her own name listed - she's a riot that way. We do plan to add her officially to the author page on Amazon within the next six months. In the meantime, you'll only find her name on the Copyright page - she is sneaky that way. Below is the pic we created for the award and here is the link to the award announcement. 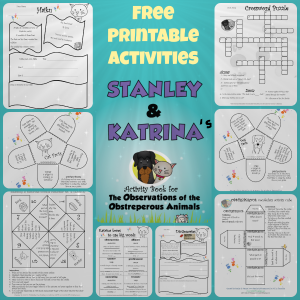 Kid Lit Printables has created fun and FREE printables for The Observations of the Obstreperous Animals and will be adding more in the future. Click here to view all available printables now. The pets are offering their first book for free, via Amazon Kindle, the first two days of the Blog Tour. Click here to download Book 1 in the Stanley & Katrina series now. Yay! We are thrilled to have you host a stop on our Book Blasty Tour, Dino Family! Thank you for the paw-riffic review, and for mentioning the printables - it made our paws dance. We have fun with the cootie catchers, too. Have a paw-some rest of the week and weekend ahead.